We quizzed our over 4,800 friends on Facebook about what was the hardest move or jump they had trouble learning. 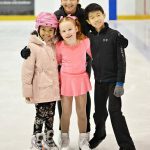 We received over 100 comments from figure skaters all around the world. Here are the results.